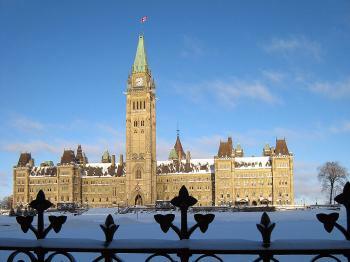 OTTAWA—As Parliament resumes after being suspended for nearly two months, three constitutional experts shared their hope that Tuesday’s budget will pass, while at the same time offering their opinion as to what should happen if it fails. At a debate hosted by the Public Policy Forum last week, Richard Van Loon, Luc Juillet, and Peter Russell gave insight into such issues as the role of minority government and the legitimacy of the proposed Liberal-NDP coalition in the context of the current political uncertainty. The prorogation of Parliament was approved by Governor General Michaëlle Jean at the request of Prime Minister Stephen Harper on December 4, four days before his Conservative minority government was to face a non-confidence vote. The vote was triggered by the Conservatives’ economic and fiscal update last November 27 which opposition parties soundly criticized for its lack of sufficient economic stimulus. They were especially outraged by proposed cuts to public financing for federal political parties, a move that would have created great hardship for the opposition parties who rely more on public financing. The Conservatives made major concessions within the next three days, including dropping the proposed cuts, but it was not enough to stop the three major opposition parties from signing an agreement to topple the government. On December 1, the Liberals and the New Democrats, supported by the Bloc Québécois, announced the formation of a coalition government led by then-Liberal leader Stéphane Dion, aiming to replace the Conservatives via a non-confidence vote. The Conservatives avoided the vote when Parliament suspended, but when they table their budget this week it remains uncertain whether they will face another non-confidence vote. If they are defeated, the Governor General may either dissolve Parliament and call an election or ask Liberal Party leader Michael Ignatieff to form a new government. Mr. Van Loon, former president of Carleton University, said if the budget fails, the prime minister will likely ask for an election, and the Governor General should accept his advice. She should not accept the coalition proposal, he said, since it does not meet the test of “democratic legitimacy” even if it may technically be possible under the “not perfectly clear” rules of Westminster parliamentary democracy. He gave three conditions for legitimacy based on examples from many countries where coalition governments are common. The country must be in “a war or dire emergency,” voters must know in advance that there will possibly or likely be a coalition, or the coalition must be led by the plurality party—the party with the most seats in the legislature. The current coalition does not meet any of these conditions, said Mr. Van Loon. In addition, during the last election, the Liberals and the NDP explicitly denied the possibility of forming a coalition. Mr. Juillet, director of the Graduate School of Public and International Affairs at the University of Ottawa, said he expects the Conservatives will likely table an acceptable budget. They now have “a more significant and credible threat” in Mr. Ignatieff, which “changes incentives on both sides of the House,” he said. Mr. Ignatieff became interim Liberal leader on December 10, replacing Mr. Dion, under whose leadership the party was reduced to 77 seats from 103 seats last October in one of its worst election defeats. Recent polls show that the Liberal Party has gained popular support under its new leader. Mr. Juillet said he had no doubt the coalition was democratically legitimate, adding that it played an important role at a time when the Liberals were in too weak a position to provide vigorous opposition to the ruling government. If the budget fails, the Governor General should allow a coalition to govern if its partners still wish to do so, said Mr. Juillet. Last week Mr. Ignatieff said Canada needs an election like it needs “a hole in the head” and said he was prepared to lead a coalition government if necessary. But he also called on Mr. Harper to deliver a budget that he can accept. Mr. Russell, professor emeritus of political science at the University of Toronto, noted that Canada has just elected its third successive minority parliament and that half of the 18 elections since 1957 have produced minority parliaments. Noting that in the first year and a half of his government Mr. Harper “showed he knew how to govern with a minority,” Mr. Russell said he hopes the upcoming budget will avoid a non-confidence vote by reaching out to attract support from the opposition. Meanwhile, Mr. Russell is among 39 constitutional scholars who have signed a letter advising the Governor General “to call the leader of the opposition to attempt to form a government” should there be a non-confidence vote or a request to dissolve Parliament. This would be most appropriate in the current situation, the letter said, since there have only been 13 sitting days of the House following the election last October 14. Mr. Juillet said the Governor General was right to grant prorogation last December because it gave time for reflection. If a coalition is eventually formed, Canadians would be assured that other alternatives were exhausted and that the government had been offered a chance to win back the confidence of the House. All three scholars agreed on the need to write down key constitutional rules such as the circumstances for calling an election and the role of the Governor General. Parliamentary rules should also be changed to ensure opposition parties have access to a vote of confidence in a reasonable time frame. If the fundamental rules of our parliamentary democracy are unwritten and are a matter of partisan opinion, it puts the Governor General in a “no win” situation and “the system will crack,” said Mr. Russell. Mr. Juillet pointed out that Canadians were becoming increasingly fed up with “the vicious nature of partisan politics” over the last few months, which contributed to the public’s misperceptions about how Canadian governmental institutions work. In successful minority governments, debates are about substance and policy rather than procedure and personalities, said Mr. Van Loon. The panellists also discussed the need to improve the functioning of parliamentary committees as an important part of policymaking.